For this swap you will make one profile-based ornament for your partner. So these ornaments will be handmade. You can crochet, sew, paint, embroider, sculpt - whatever type(s) of crafting you enjoy. We want to send quality items to our partners, so this is not necessarily a good time to try a new technique. You will have 3 weeks to create and send an ornament for your partner. What makes this ornament swap special is that it does NOT have to be Christmas or winter themed. So if your partner has a penchant for pink elephants, make her a pink elephant ornament. If she goes crazy over cats, make her a kitty ornament. If she loves cooking, make her a mini cookbook ornament, or a mini spatula, or a mini colander! The possibilities are endless. Get creative and have some fun! Why would you want a non-Christmas-related ornament? You can make your Christmas tree unique (we have a stingray, a strawberry, and a steam engine to hang on our tree besides the usual stars, Santas, and snowmen). 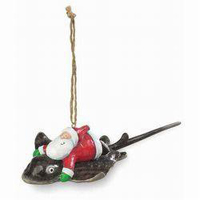 Or hang your ornament somewhere else â€“ even all year round. Hanging ornaments don't have to be placed on trees - they can be hung on the rearview mirror in your car, used as a decoration in your home, or even strung on a key-ring or necklace if they aren't too big. Iâ€™m sure there are many other uses, as well! You may certainly wrap the ornament you send to your partner if you would like, though it is not a requirement. Please be sure to protect the ornament with bubble-wrap if it is fragile. Hopefully you will love the ornament you receive, but even if it isnâ€™t your favorite, remember to rate a 5 if you receive a good-quality, homemade ornament from your partner. This is a US-only swap as not all ornaments are flat and cheap to ship, but I will make an international version if there is interest.